The Redway Runners turned the capital green this Sunday, 23rd April, with over 30 members taking to the world renowned marathon course. Runners were joined in London by a coach full of supporters from the running club. Alex Webb, Helen Whalley and Steve Morris were the lucky recipients of the running club ballot places and all took part in a series of Sunday marathon training sessions around Milton Keynes. Genci Alb topped the club tables and shadowed the pros throughout his marathon, finishing in 02:36:30 while Jen Sangster topped the ladies finishing times for the club with an impressive 03:09:22. 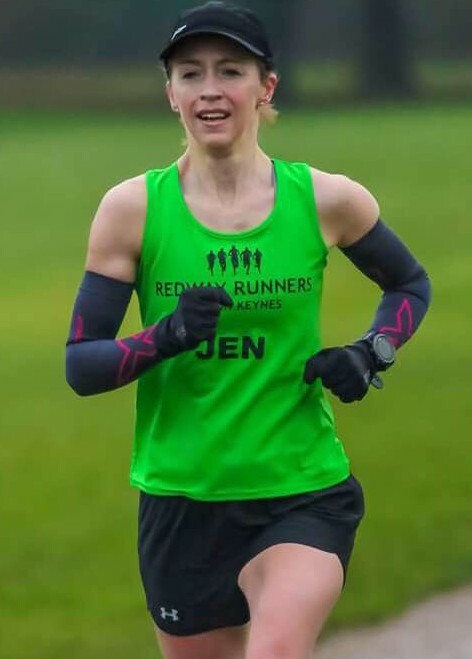 Jen qualified to run for the Great Britain Masters marathon team at the Manchester Marathon at the start of April and it is clear that she will be one to watch. The club congratulates all members who took part for completing the 26.2 mile course and for raising thousands of pounds for a variety of local and national charities. Special club quizzical run at 10am, meet outside the entrance to Tescos Wolverton for a run about 1 hour led by Martin. The route is a bit of a secret!, with industrial heritage (Canal, railways old and new), and sport themed (Petanque, Football stadiums and cycling race track) all included not to mention the manor house – this run will be on the format to the Sunday club run. Step Up run led by Glenn Dickinson for runners at 10.30 minute miles and above. Social run, led by Steve Boothby and will cater for runners quicker than 10.30 minute mile pace. ‘Last weekend, I, along with a number of other awesome Redway Runners, traveled up to Manchester to run the marathon. This was my first of 4 events this month but this was the most nerve wracking for me! I was attempting to qualify in the Age Group Masters to represent England in the marathon! No pressure then! I had to come in the Top 5 in my age category to get through but that meant I had absolutely no idea how fast I had to run! I just had to come in the top 5. So, I did what I could and gently aimed to pass any woman I could see ahead of me… starting as 47th lady, 29th by halfway and finishing 19th overall. Had I done enough? I phoned Andy to tell him I’d got a PB… and he told me the result…I’d come 1st in my age category! Yes I cried! I still can’t quite believe it. I’m going to represent England at the Chester Marathon on 8th October 2017! And I get to wear the England kit too (sorry Martin, it’s not green!). I couldn’t have done it without the support of all you lovely people.